1) programs can be bigger that physical memory size since only a portion of them may actually be in physical memory. Operating System's goals are to make virtual memory efficient and transparent to the user. Demand paging is a common way for OSs to implement virtual memory. Demand paging ("lazy pager") only brings a page into physical memory when it is needed. 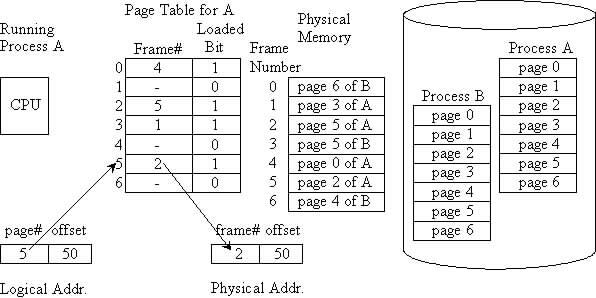 A "Loaded bit" is used in a page table entry to indicate if the page is in memory or only on disk. 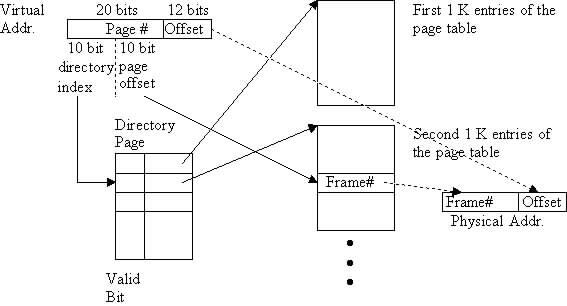 A page fault occurs when the CPU generates a logical address for a page that is not in physical memory. The MMU will cause a page-fault trap (interrupt) to the OS. 1) Check page table to see if the page is valid (exists in logical address space). If it is invalid, terminate the process; otherwise continue. 2) Find a free frame in physical memory (take one from the free-frame list or replace a page currently in memory). 4) Since the disk operations are soooooo slooooooow, the OS would context switch to another ready process selected from the ready queue. 5) After the disk (a DMA device) reads the page into memory, it involves an I/O completion interrupt. The OS will then update the PCB and page table for the process to indicate that the page in now in memory and the process is ready to run. 6) When the process is selected by the short-term scheduler to run, it repeats the instruction that caused the page fault. The memory reference that caused the page fault will now succeed. To achieve acceptable performance degradation (5-10%) of our virtual memory, we must have a very low page fault rate (probability that a page fault will occur on a memory reference). When does a CPU perform a memory reference? 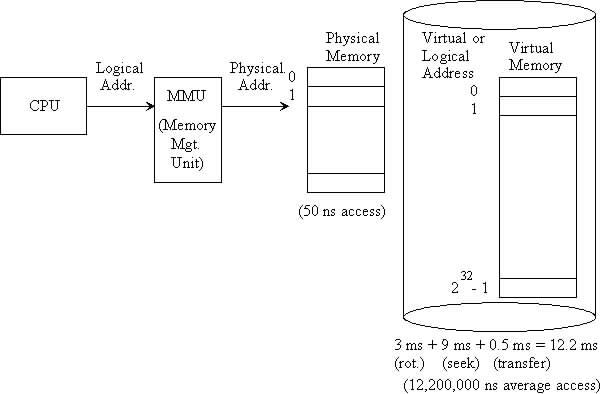 If it is in memory, then each memory reference in the program, results in two memory accesses; one for the page table entry, and another to perform the desired memory access. 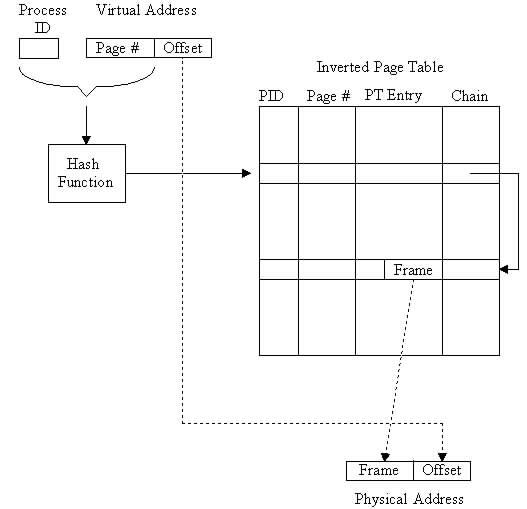 Ideally, when the CPU generates a memory reference, the PT entry is found in the TLB, the page is in memory, and the block with the page is in the cache, so NO memory accesses are needed. However, each CPU memory reference involves two cache lookups and these cache lookups must be done sequentially, i.e., first check TLB to get physical frame # used to build the physical address, then use the physical address to check the tag of the L1 cache. Alternatively, the L1 cache can contain virtual addresses. This allows the TLB and cache access to be done in parallel. If the cache hits, the result of the TLB is not used. If the cache misses, then the address translation is under way and used by the L2 cache. a) two-level page table - the first level (the "directory") acts as an index into the page table which is scattered across several pages. Consider a 32-bit example with 4KB pages and 4 byte page table entries. 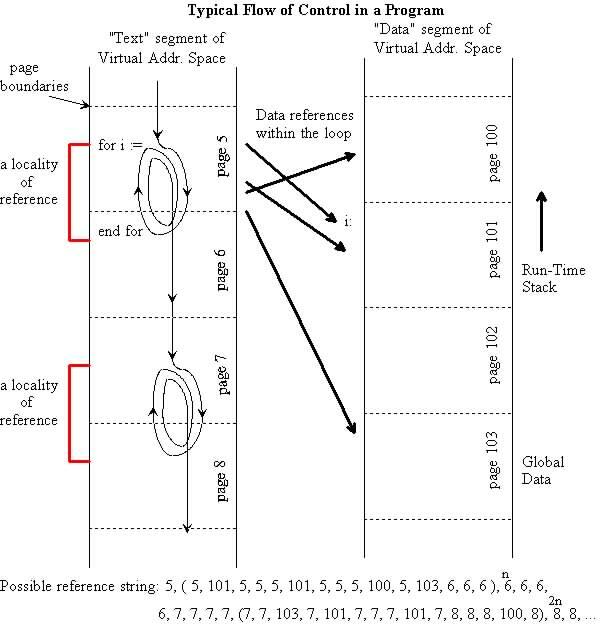 2) have good phase transition - "forget"/replace pages of the old locality of reference when the program moves on to a new locality of reference. What information would we need to keep track of to implement LRU? 2) stack - (like above tables) indicating the order of usage. Either of these faithful implementation of LRU would be expensive!!! Both would require a substantial amount of work with each memory access. On a page fault, select the page with the smallest counter/history bits to replace. For example, consider the following collection of couter/history bits.